Providing healthcare coverage for associates who work an average of 30 hours a week presents compelling savings. These savings come from healthcare that addresses the importance of a healthy lifestyle, careful management of chronic conditions, and proactive screening for common health issues. Visit the Services page for our current list of healthcare amenities. 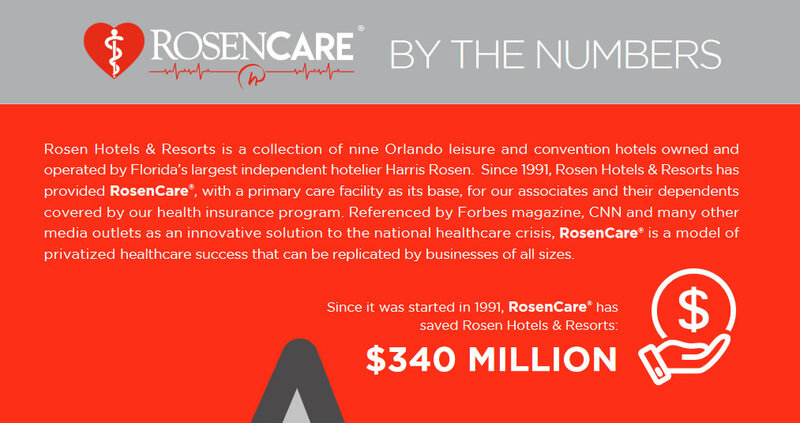 “Rosen Hotels & Resorts’ 26-year healthcare initiative is the precursor to what we have defined as the national RosenCare program, which we believe may very well create results comparable to our own, but of course on a much larger scale. If the entire public and private sector implemented a RosenCare model, we would anticipate annual savings of approximately $935 billion, simply by preventing unnecessary illnesses and diseases and by emphasizing the importance of a healthy lifestyle. What follows is a proposed comprehensive healthcare plan for our nation. Our plan, which we believe to be the Real Affordable Care Act, guarantees that every American shall have access to affordable healthcare. In lieu of the ACA, employers would provide healthcare coverage for their employees who work a minimum of 25 hours per week and for their dependents as well. The Federal Government would offer a tax credit to all private sector employers who provide healthcare coverage for their employees. We suggest a tax credit of $4,000 per employee (see page 6). Employers may request that their employees make a contribution to the health coverage plan. Annual employee contribution shall not exceed $1,000 for single or $2,000 for family coverage, which shall be tax deductible to the employee. Statistically, the average employee covers approximately one dependent. The Rosen model gross cost is $9,800 for two covered lives. The $4,000 tax credit plus the $2,000 employee tax deduction equals $6,000 and leaves the balance of approximately $4,000 of the cost to the employer. Conversely, employers today, without the Rosen model, have an average gross cost of $15,384, with the average employer portion of $12,154 for the two covered lives. Our plan saves the employer an average of $8,000 per employee. These savings provide the employer with resources to grow their business, make capital improvements, investments, increased wages, or create more jobs which will ultimately have a significant multiplier effect on the nation’s economy. Employers would not be mandated to implement this model. However, if they opt to do so, the employer tax credits and employee tax deductions outlined above would be available.